Since I’m not sleeping the best at night these days, by the time afternoon hits, I’m more than ready for a nap. Some days I give in. I didn’t want to do that today. So what’s a girl who needs a nap but doesn’t want one to do in order to stay awake? Why, go play in the dirt, of course. We had a decent-sized garden this year, our first real endeavor in the dirt here at the new house. Beans, tomatoes, potatoes, peppers, cucumbers… and sweet potatoes. Some of the bounty didn’t produce, some did well, some were mediocre in their growth. We definitely have some amending to do to the soil. It was an experiment of sorts to see how well things did and how well we did too. At this point, I can say we’ll likely be trying again next year, and we’ll expand the plot as well. There wasn’t room for everything once it started growing. Oops. As the weather here has been odd this summer, everything that was producing in the garden was pretty well finished a month ago. All except Herbert and Friend. About ten months ago, we had a sweet potato that we’d purchased to eat. 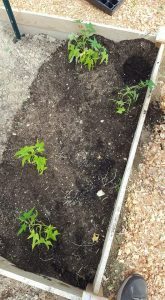 You know how it goes when sometimes you don’t get to the fresh produce in a timely manner and things start… growing? Yeah. That happened. Now, most of the sweet potato was still edible, but one end, it had sprouts and tiny leaves. Not feeling like running to the store and knowing there was nothing wrong with the bulk of the potato, we cut the end off. Let me tell ya, that was a yummy sweet potato. A red garnet, I believe. And the end with the sprouts and leaves? For some reason, I kept him. Him? Young Herbert, a few weeks old. Him. This, my friends, is Herbert the Sweet Potato. Not only did he sprout, he excelled. For the first few months, he lived in this tiny glass yogurt jar. 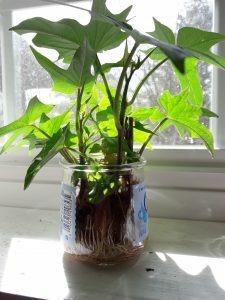 Eventually, the same thing happened with another sweet potato, and we chopped off the growing end and put it in a jar too. That became Friend, so named because yours truly can’t remember what she named him! And the two sweet taters were growing side-by-side in the kitchen window so… Herbert and Friend. Let me tell you, they didn’t even have DIRT for months. They sprouted and grew and grew and grew… and got “haircuts” and grew and grew. Early this year, we got a small bag of potting soil and carefully broke Herbert’s yogurt jar. For the first time since he was originally plucked from the ground, he felt dirt on his roots! It was a sweet and joyous day full of much celebration. Okay, I posted about it on Facebook. And smiled a lot. Close enough. I’m ridiculously attached to this sweet potato. Can you tell? But this spring, Herbert was looking kind of puny. I mean, he was about a two inch by two inch piece of sweet potato, and there was only so much energy in his little self. You know? It was obvious that most of it had already been expended. Oh, dear. When we started the garden, I knew I wanted to do sweet potatoes. And here we were, with two pitiful little sweet taters growing in the window and dying on the vine, so to speak. But could they make the transition from jar to garden and survive? Was there enough energy left in Herbert and Friend to grow? Yes. The answer is a resounding yes. Not only did they grow, they thrived! From each potato remnant, I got four or five “slips,” as they’re called. The slips are the “starts” of the plants, complete with leaves, roots, vines, etc. If you order sweet potatoes to plant or buy them at a garden center, that’s what you get. Herbert on his first day in the garden. For the first few days, Herbert and Friend wilted. I had my doubts. But then they perked up. The nutrient-rich soil – yes, I gave them special soil to grow in – penetrated the root systems. Before long, they were not just growing, they were lush. Strong, healthy vines spilling over the edges of their boxes, eager to go forth and… well, propagate I suppose. Today, figuring it was as good a time as any, I started digging Friend and Herbert. Friend was first – as much as I like Friend, I’m not as attached to him as I am to Herbert. If things were going to go wrong, I’d prefer to start there. But they didn’t go wrong. Friend had been prolific! In a two foot by four foot space, I probably netted close to half a bushel of potatoes. A lot of them were small, but there were enough of a decent size that we’ll get several meals from them. And the small ones are edible. They’ll just not need as long to bake. Thrilled with my find, Herbert was next. I cleared away the vines that covered half of his “nest” and started gently digging. Holy wow. 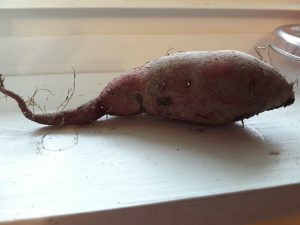 Herbert, my sweet little potato, had done REALLY well for himself. Now, I only dug about a quarter of his plot before I ran out of steam, so I expect to get quite a few more treasures from his soil in the next couple of days, but wow! One of the sweet potatoes Herbert produced? About a foot long and FAT. The others I saw weren’t anything shabby either. I couldn’t be prouder of my window-dwelling friends. Really, seeing those sweet potatoes made my day. Knowing that from some fragile green vines came such strong, healthy, and hopefully delicious bounty… that’s amazing. Something that could have been thrown away, discarded, seen as garbage, produced food we can eat! You just can’t wrap your head around it, it’s so amazing. At least I can’t.